Felix is in real trouble this time. 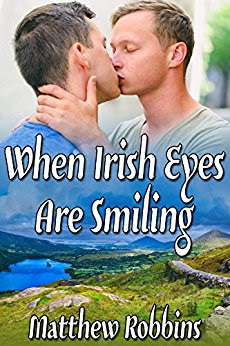 Not only did he wake up nearly naked in a foreign country -- drugged and abandoned as a prank -- but soon he finds himself being interviewed by the police after crashing the truck of his handsome rescuer, Ronan Malloy. The only way for Felix to make amends is to work off his debt on the injured Ronan’s shabby, struggling farm. Ronan Malloy and his grandad Lorcan have big plans for their ancestral farm. Their new boutique cheese will put Malloy Cheesery the map. But he hasn't struck it rich yet. Between the bank and his scheming neighbor, he has enough troubles and doesn't want to deal with an untrained Yankee on top of it. Although Felix resents having to stay behind as his friends continue their backpacking adventure across Europe, he begins to see that farm life isn’t so bad. Ronan’s charming smile and sparkling eyes are an added bonus. And Ronan learns soon enough that the Yankee isn't as helpless as he thought. Felix isn’t sure he’s up to the task of saving the deeply indebted Malloy Farm from calamity and devious plots for its downfall, but for Ronan, he’s willing to try. Felix nodded and slipped out of the truck. After seeing how passionate Ronan was about the farm and its future, the thought that he had nearly ruined everything with a stupid mistake weighed heavily on him as he picked his way toward the waves. As exciting as photographing dozens tiny details in town had been, Felix was invigorated by the wild Irish sea and her rocky coast. It seemed everywhere he looked provided an opportunity, a moment in time that needed to be documented. He wasn’t sure how much time had passed, but he was surprised as he made his way back to the truck that Ronan, leaned against a large briny rock, had not noticed his approach. Camera ready, Felix focused on the most interesting piece of jetsam he’d run across today—a handsome Irishman. The slope of Ronan’s brow, his proud nose, and full lips were made to be studied. If Felix had been given a box full of facial features and a hot glue gun, he’d never have been able to make a face that pleased his eye more than the one on the man he was watching breathe in the fresh sea air with satisfaction. Felix had never been able to look at Ronan so long before. Those devilish eyes, quick with a joke or a wink, missed nothing. Felix couldn’t look at Ronan without being looked at in return. Felix’s camera traveled down Ronan’s solid arms to the bandages at his hands. They were looking damp and ratty, loose around the edges and decidedly ready to be changed. He felt guilty he hadn’t changed them recently and he lowered the camera. To his surprise, Ronan was no longer looking out to sea, but directly at him. With a chuckle, Ronan waived him over. “Not quite.” Felix found a spot to lean against Ronan’s rock. The two regarded the sea together in quiet contemplation. With a sigh, Felix said, “Tom.” He was tired and still feeling a buzz from the Guinness. Subterfuge was beyond his abilities at the moment. “I dunno.” Felix kicked at the sand with the toe of his shoe. Ronan nodded. His eyes bore into Felix and Felix decided he might as well tell the whole truth. He felt Ronan knew it anyway. “And he kissed you,” Felix said. Felix nodded and looked away. Surprised, Felix turned to Ronan and Ronan’s lips crashed against his, matching the crashing waves of the ocean at their side. Felix could not catch his breath. His entire being was consumed by lips and tongue, bandaged hands at his back and in his hair. When Ronan finally pulled away, Felix’s soul screamed out in despair, matching the gull screams all around them. More. More. More. Matthew enjoys writing in the quiet hours of early morning when anything seems possible. When he’s not writing, he loves spending time with his patient and sweet husband Josh or creating anything with his hands—watercolor painting, crochet, wood working. His wacky and loyal clients fill his head with tales of places near and far, adventures mundane and insane, and secrets so scandalous that he can’t help but be inspired as he cuts and colors their hair in a lively neighborhood hair salon. He credits large amounts of caffeine and Neil Dyer’s intense music playlists for helping bring it all together on the page for his reader’s enjoyment.